Snorkels in the price range of USD 50 or less are the highest selling products in the market. These are generally bought by retail customers through company stores, specialty stores, online stores and in hypermarkets. Whereas, snorkeling fins priced USD 100 or less are highest selling price category of fins primarily sold through company stores. The US has been the market leader in terms of manufacturing and consumption demand of Snorkeling equipments worldwide. Leading players are originally from Europe which includes Aqua Lung and Cressi Sub. These players would dominate the competition landscape even in the forecast period due to higher investments done towards new product launches and brand marketing activities. Japan, Australia, New Zealand, Taiwan, South Korea have been major countries in APAC facilitating fast-pace growth in the market. These regions would dominate in the coming future with rise in both consumption and production activities. 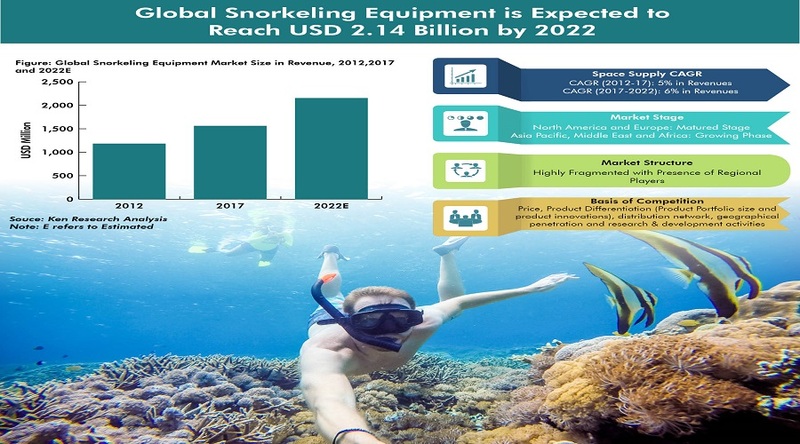 The Snorkeling Equipment Manufacturers in the market are expected to focus more on innovative product offerings with respect to design, color, shape and weight, to meet the needs of individual consumers. The launch of innovative products in the market shall raise the replacement demand for the equipments. Additionally, competitors are focusing on developing advanced snorkeling fins that are better than regular fins currently available in the market. Many types of equipments are manufactured using high-tech materials that are strong yet lightweight, flexible and resistant to chemicals, which are being marketed by global competitors. Subsequently, consumers now prefer purchasing equipment with new and improved features that suit their specific needs. This, therefore, is likely to escalate the growth of global snorkeling equipment market during the forecast period. The region Americas is expected to dominate the market in the coming five years, owing to an increased participation rates and popularity of new snorkeling sites in the region. The US is expected to be the leading country in this region. Some of the best snorkeling sites in the country like Virginia Beach, Block Island, Riviera Beach, Key Largo and Kankakee are expected to attract more tourists. APAC is anticipated to be the fastest-growing region among all the other geographical regions in the global snorkeling equipment market. Growth in APAC has been supported by rising popularity of soft adventure water sports and tourism. South Korea and Australia were the major markets contributing to the revenue of APAC. Australia is the most popular destination for snorkeling due to the presence of the Great Barrier Reef with more than 2,900 individual reefs, which stretches for more than 2.6 kilometers. Great Barrier Reef is one of Australia’s prime tourist attractions. Most of the activities in South Korea happen in the east and south coast of the region, where water is the warmest in the south and southeast coast, with a temperature of 73.4°F. Seonjaedo, Sinuido, Hongdo, Cheongsando, Ulleungdo and Deokjeokdo are some of the top snorkeling sites preferred by tourists in the country. The number of snorkeling sites in South Korea has increased to 51 in 2015 compared to 33 in 2009. Furthermore, Indonesia, Hong Kong, Taiwan, Thailand and Singapore are some of the other prominent countries for snorkeling. Among these countries, Indonesia is situated in the middle of the Coral Triangle, which makes it a major epicenter for marine diversity and variations. A large number of marine life forms are attracted to the coasts of Indonesia due to the abundance of corals. This in turn manifests the region to house the maximum number of coral life species in the world, making it a very attractive snorkeling destination. Hong Kong has a coastline that stretches over 455 miles and offers snorkeling sites, which are shallow and warm. These are regarded as some of the major underwater attractions. Hong Kong’s East Ping Chau Island is popular for the presence of large number of turtles, anemone fishes and hard and soft coral growths, which make for an attractive snorkeling destination. Analysts at Ken Research in their latest publication “Global Snorkeling Equipment Market Outlook to 2022 – By Equipments (Snorkels, Snorkeling Masks, Snorkeling Fins and other accessories), By Region (Americas, Europe, APAC and MEA) and By Distribution Channel (Company Stores & Specialty Stores, Hypermarkets, Online Stores, Small Retail Stores)” believe that free trial and rental facilities, technological upgradation and major thrust from APAC region would enable the market to register a CAGR of around 6% during the forecast period. The report covers market introduction, market nature, value chain analysis and market size on the basis of consumer expenditure in detail. Market Segmentation by Equipments (Canoes & Kayaks and Gear & Accessories), by Region (Americas, Europe, APAC & MEA), by New & Existing Demand and by Distribution Channel (Company Stores and Specialty Stores, Online, Hypermarkets/Department Stores/Supermarkets and Others) have been given prime importance. The report is useful for water sports equipment manufacturers, rafting equipment manufacturers, distributors, specialty sporting goods stores, department stores, e-commerce portals, customers and other stakeholders to plan their market centric strategies in accordance with the ongoing and expected trends in the future. The report facilitates the reader with the identification and in-depth analysis of the existing and future trends and issues that impact the industry. The report apprises the reader on the growth in the future depending upon changing industry dynamics in coming years. The report is useful for water sports equipment manufacturers, Jet Ski equipment manufacturers, distributors, specialty sporting goods stores, department stores, e-commerce portals, customers and other stakeholders to plan their market centric strategies in accordance with the ongoing and expected trends in the future.